Home / Astronomy / Why Is Mercury's Transit of the Sun So Rare? Mercury will cross the sun's face from Earth's perspective on Monday (May 9) in the first such "transit" since 2006, and the last until 2019. Most of the world will be in position to witness Monday's Mercury transit, weather permitting, though observers will need a telescope to see it well. But remember: NEVER look directly at the sun without a solar filter or other appropriate eye protection; blindness can result. Mercury transits occur just 13 times per century, on average. They're so rare because the innermost planet's orbit is inclined by about 7 degrees compared to that of Earth, so Mercury, the sun and our home planet just don't line up all that often. These nodes line up with the sun from Earth's point of view just twice per year, once in May and once in November. 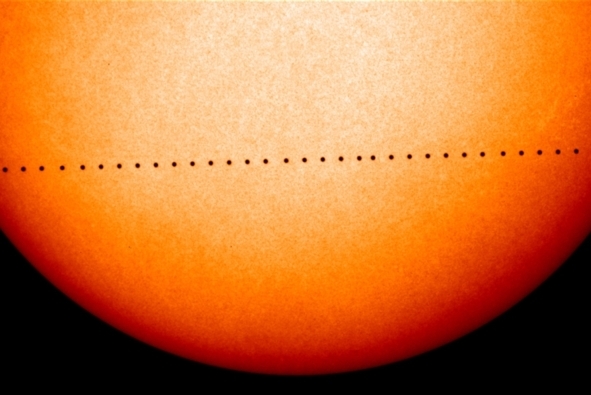 If Mercury happens to be at the node at either of these times, Earth observers see a transit. (All Mercury transits occur within a few days of May 8 and Nov. 10.) Mercury's orbit is elliptical, so May transits and November transits are different beasts. Planetary transits beyond our solar system are visible as well, with the aid of powerful instruments such as NASA's Kepler space telescope. Indeed, Kepler has discovered more than 1,000 exoplanets (and an additional 3,600 planet "candidates") by noticing the tiny brightness dips these worlds cause when they cross their parent stars' faces from the spacecraft's perspective. Astronomers can also learn about the composition of exoplanet atmospheres by studying the starlight that filters through them during transits.